ASTYMIN GET ALERT PROMO. N100,000 TO BE WON DAILY. SCRATCH, SEND CODE FOR FREE TO 1393 AND WIN. STAND A CHANCE TO WIN N100K DAILY. ASTYMIN is set to reward you loyal fans, followers and consumers for your supports and patronage, in the ongoing Astymin Get Alert Promo. The campaign is part of activities to celebrate 15 years anniversary of Astymin in Nigeria. It is the brand’s way of rewarding you with total well-being for your bodies, money in your pockets and smiles on your faces. From 1st of February to 31st of December, 2016, one hundred thousand Naira (N100,000) will be won by TEN Winners daily, while one lucky Star-Winner will also smile home with another one hundred thousand Naira (N100,000) every month. 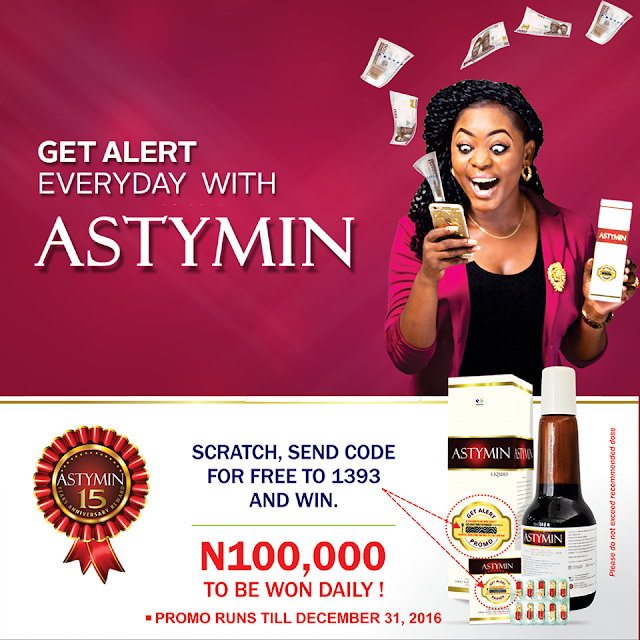 Interested participants are expected to buy Astymin from any nearby pharmacy and check the pack for Astymin Get Alert seal with a scratch box. The box is scratched to reveal an entry number, which will be sent to the short code, 1393 for confirmation. Instant SMS reply will confirm the entry with further instructions. Draws will be done daily and ten winners selected by the system will receive SMS, which should likely read; “Congratulations, you have won 10,000 in the Astymin Get Alert Promo. You will be contacted shortly with 08077008888” from 1393. Cash reward will be sent to the winners either through online transfer or hand collection at the Fidson Head office. Winners’ list will be published on the ASTYMIN website’s landing page, social networks, as well as on the Punch and Guardian newspapers every month. GET ALERT in your BODY and POCKET! Promo runs From 1st February to 31st December, 2016.